I won’t normally blog twice a day and I generally won’t blog on the same day as I had the QSOs but as I’m not going to be on the wireless again today I thought I may as well post. I’ve had three QSOs today, the first was on 7MHz where I worked IK4HLQ, Joe in Modena, later I doubled the frequency and worked OK2BIQ, Jan in the Czech Republic and then this afternoon I doubled the frequency again and had a QSO on 28MHz. This was a good one. Totally on the off chance I switched the real time QSO maps on DXInfo to 28MHz and noticed lots of lines on the map. I unplugged my long wire and plugged the 5/8 vertical for 10m in and had a tune around. On 28.490 I heard V5/DJ2HD calling CQ and working lots of people. I had no idea where V5 was but gave a couple of calls anyway with no reply. I then realised that he was calling “QRZ, up 5” and I worked out from this that he was working split frequency. Hmmmm, I’ve never done that before but fortunately on my radio it’s very easy to do. Press and hold A>B, push the ‘split’ button and then use the sub-tune to QSY the transmit frequency up by 5KHz. Once I did that I called him and he replied to me first time. V5 is Namibia! I did a google search and discovered that V5/DJ2HD is Mathias who is operating from there from 26th December to 16th January so I was really pleased to have worked him. He was one of the best operators I’ve heard for managing a pileup and did a thoroughly good job. Once I’d worked him I called my son into the shack, wound the power down to 10 watts and although it took a couple of calls, David worked him as well. So that’s my QSOs for day #9. 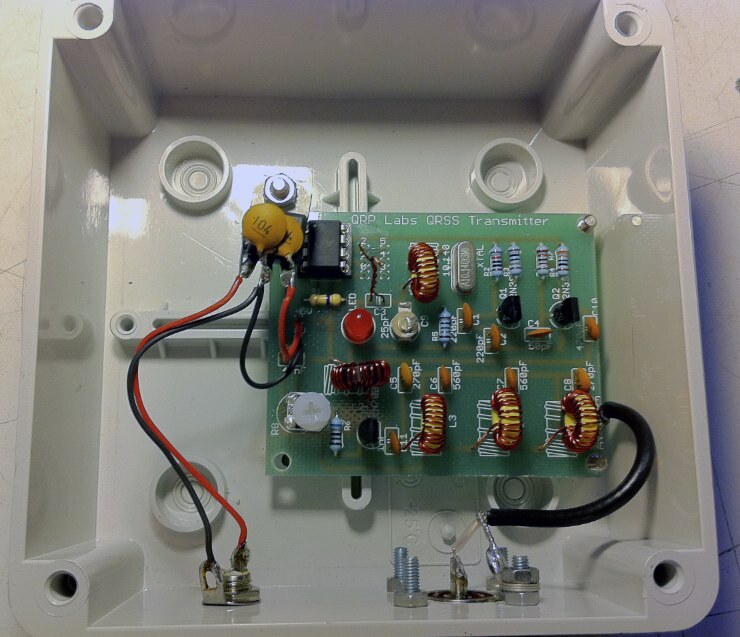 The reason I won’t be making any more today is because I spent some time with Tony, G0MBA this afternoon and now my 30m QRSS transmitter is all built into a box and is transmitting a beacon on 10.140.040MHz where I’ll leave it running overnight. I’ll keep an eye on the grabbers and see if I’m heard anywhere. This entry was posted in Amateur radio, Construction, CW, HF, New DXCC, QRSS, QSO365, SSB and tagged Hans Summers, QRSS, QSO365. Bookmark the permalink.